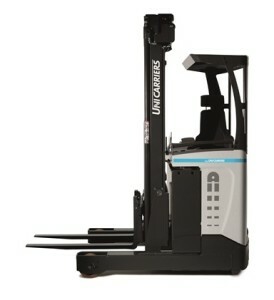 Unicarrier’s reach trucks bring warehousing efficiency to another level. Each machine is designed around the operator and can perform almost any material handling task required. They come in a number of models including four way reach, narrow-chassis reach and with options of telescopic forks for double deep applications. They perform effortlessly in high intensive operations and in almost any warehouse environment including cold stores and high bay racking. Reach trucks are perfectly designed for internal transport and stacking up to 2,000 kg. We can also supply a wide range of extra equipment including active spin reduction, ergo-logic operator interface, fork level assistance system, fast track battery change systems, video camera and cold store cabins. All machines are available to hire from 1 day right up to 5 or 6 years to suit your requirements. To buy a reach truck or hire one for any period of time call us on 01937 585 057 for more information.